My former blog angelchen1111.blogspot.com doesn’t update in technorati at all, except for the links. The last date I updated it was Saturday, October 21, 2006. but in technorati it says it was updated 67 days ago, the exact day I created that blog in Blogger. I don’t know why, I only have problem with that blog, I don’t have problem with other blogs like this blog and the other blog from Blogger. In Blogger Beta you can move the widgets up and down, but you can’t flip the post body to the right or left of the sidebar. Here’s an easy way to do that without widgets. To move the sidebar to the left find the section main or main-wrapper and change float:left to float:right, then find the section sidebar or sidebar-wrapper and change float:right to float:left. To move the sidebar to the right just do the opposite, change float:right to float:left and float:left to float:right. After flipping them you might want to flip the backgrounds as well, and fine tune the layouts to make your blog look well. Today I finally switched my blog to beta after the link to switch is available. After switching since I kept the old template unchanged, because of this the only change I could see is an improved Navbar, nothing else seemed to change. I have other beta blog with the new template that looks very cool, I wanted to upgrade this blog’s template to a new one too, so that I can organize my posts by putting labels for each posts and separate them into different categories. But my old template had too many customizations that won’t work well in new templates, especially putting the ads right after the posts, if I put the ad codes right after the post body the scripts between will be gone. I have to hang on until beta improves more before using new template. I liked the new Navbar very much, now on its right side you can see your email, make new post and customize your blog. The Navbar’s codes are also friendlier for the search engines and other content targeting programs like adsense since it’s loaded inside the iframe, and it doesn’t have any hidden texts like “Notify Blogger about objectionable content. What does this mean? Blogger Â· Send As SMS” that confuses the search engine. Next time when I google my blog the result’s description will show the contents of my blog instead of those hidden texts. 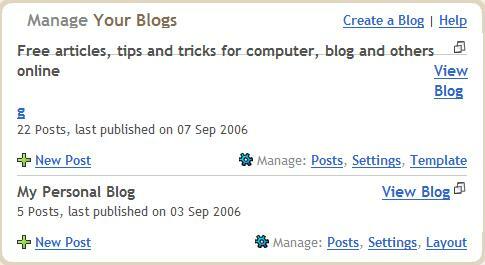 trivia: There’s a little extra “g” in my blog that I just upgraded in the “manage your blogs” section. Did you know that Blogger.com‘s template is just a special HTML file with some special template tags in between? That means you can customize your blog just like editing a web page. That gives you the maximum flexibility to customize the blog’s design. You can add and change anything you want from top to bottom. To learn more about the template tags and what they do please visit http://help.blogger.com/bin/answer.py?answer=42095. I found it useful to put <meta name=”description” content=”<$BlogDescription$>”> into your template’s <head> section, so that search engines will show your website’s description in their result instead of some stupid message like “Notify Blogger about objectionable content. What does this mean? Blogger Â· Send As SMS Â· Get your own blog Â· Flag Blog Â· Next blog” if you have NavBar on. Copy the codes you want to paste into the post and paste it into a HTML editor (like FrontPage)’s design section. Check the source code of the contents you just pasted, you will notice that the symbols “<“, “>”, or others became &?? ; now you can copy those codes with &?? ; and paste them in the posts, although you still see &?? ; now, when you published your post the &?? ; will become the appropriate symbol again when it show in the blog. Note: You can’t get away with it by putting the unmodified codes inside the text box, Blogger’s editor still won’t let you save it even if you do that.